Amit Shah, who is contesting the Lok Sabha elections for the first time, said he is "blessed" to contest from the seat which leaders like party veterans Atal Bihari Vajpayee and LK Advani have represented. Amit Shah will contest Lok Sabha elections from Gandhinagar. BJP president Amit Shah on Saturday said that he will be left with a "zero" if association with the party is taken away from his life. "If BJP is taken away from my life, only ''zero'' will be left. 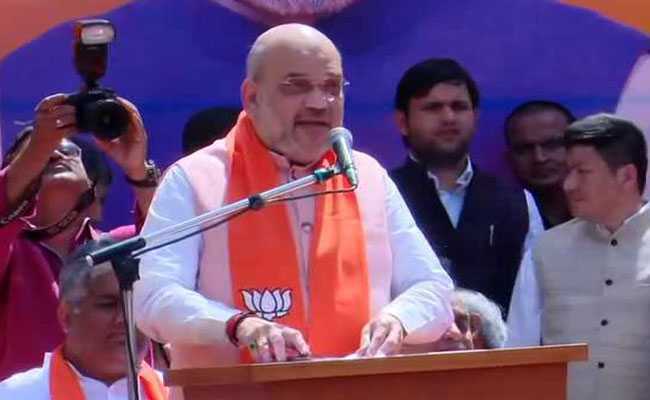 Whatever I have learnt and given to the country all belongs to the BJP," Mr Shah said while addressing a rally at Naranpura area of Ahmedabad, before filing his nomination from Gandhinagar parliamentary constituency today. "Lal Krishna Advani and Atal Bihari Vajypayeeji were MPs from Gandhinagar. I am glad that a have got an opportunity to become MP from the same constituency. BJP is a party with ideology. It is a party, which is moving forward on the principles of Deen Dayal ji," he added. Talking about Prime Minister Narendra Modi's achievements during the last five years, the BJP chief said, "Today, people have a question who will provide security to the country. Only Prime Minister Narendra Modi, the BJP and NDA government can provide security to the country." Before filing nomination, he paid tribute to Sardar Vallabhbhai Patel and also held a roadshow. He filed his nomination this afternoon, flanked by union ministers Rajnath Singh and Arun Jaitley, and Shiv Sena chief Uddhav Thackeray in a massive show of strength by the National Democratic Alliance or NDA. His son Jay Shah was also present at the ''Vijay Sankalp Sabha''. Voting for all the 26 seats of Gujarat will take place on April 23.